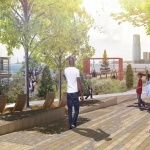 Construction on the $30 million renovation of Tribeca’s Pier 26 is slated to start up this summer, and the Hudson River Park Trust and landscape architects OLIN have released a new batch of renderings of the project’s final design. 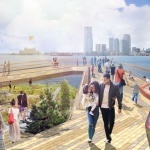 The Hudson River Park Trust went before Community Board 1’s Waterfront, Parks & Resiliency Committee last Tuesday and revealed their finalized design for transforming the 790-foot-long concrete pier. 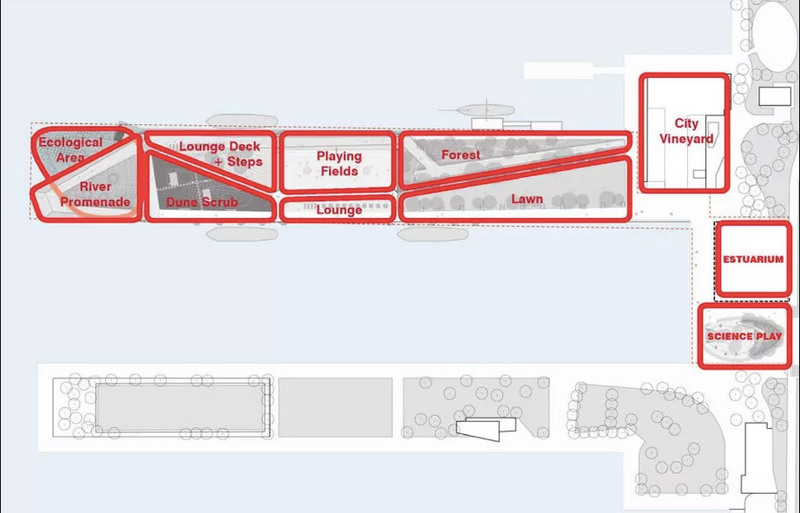 While OLIN had released glimpses of the pier’s programming before (including a playground with two enormous sturgeon-shaped jungle gyms for kids to climb), the latest design incorporates many of the features that the local community had hoped for. 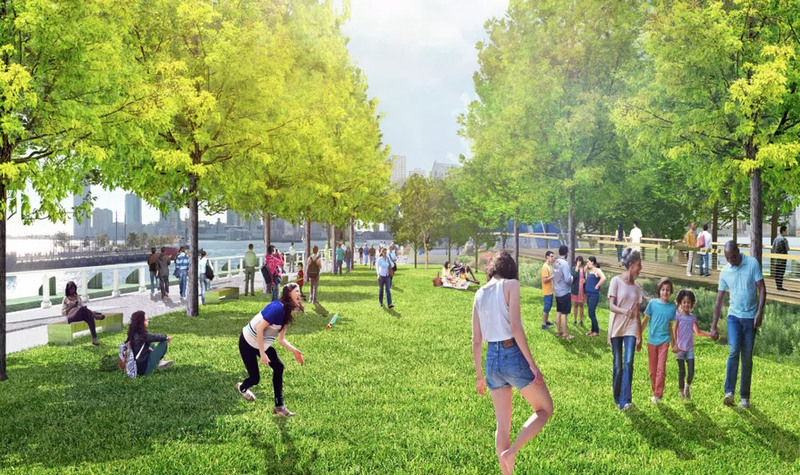 A gentle grass lawn and more wildly-planted “forest” area with indigenous trees will guide visitors from the western edge of Hudson River Park, towards the two child-sized soccer fields in the middle of the pier. 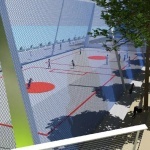 The fields will be covered in a blue net to stop stray balls from flying into the Hudson River, and surfaced with a plastic grid capable of draining. 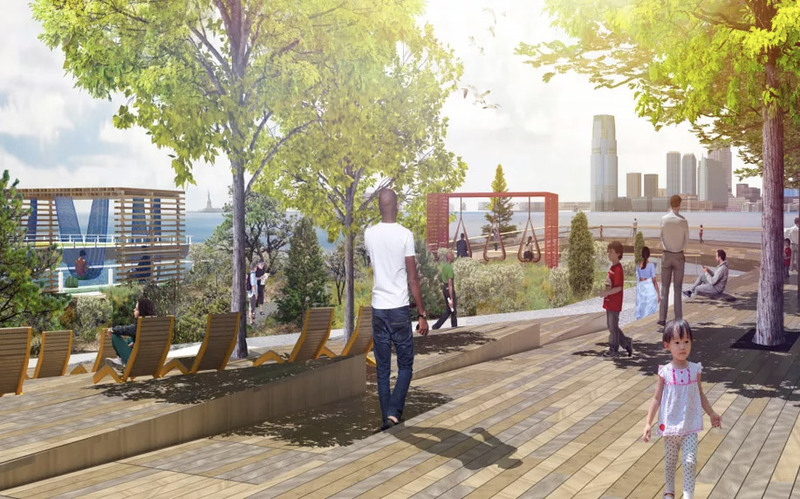 Further west will be a lounge deck with steps adjacent to scrubby, dune-like landscaping. 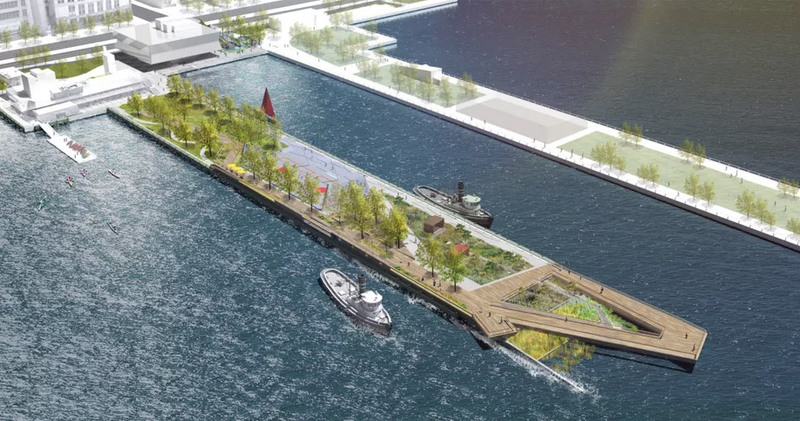 OLIN has designed a tiered tidal pool planted with native flora at the pier’s westernmost tip, as well as a wooden esplanade that zigzags across the length of the pier. 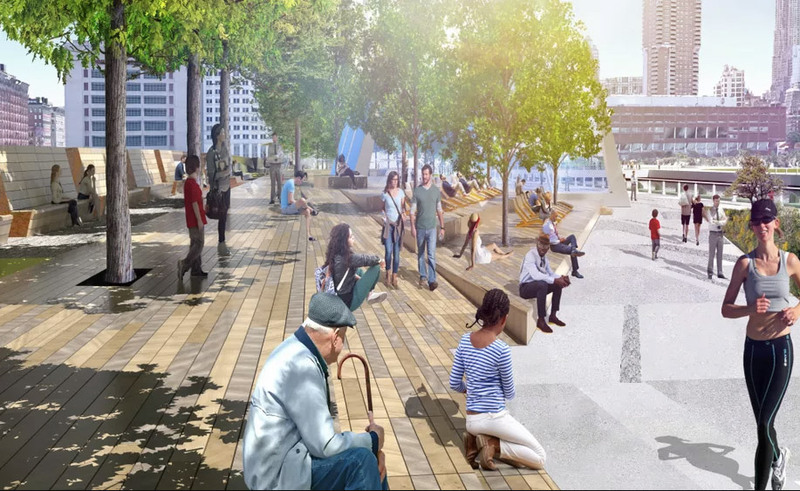 The walkway will rise 15 feet in the air at the tip of Pier 26, giving guests a full view of both New Jersey across the river, as well as the tide pool below. 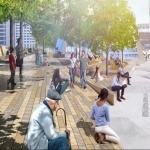 OLIN will be using Kebony for the path, an engineered sustainable softwood. 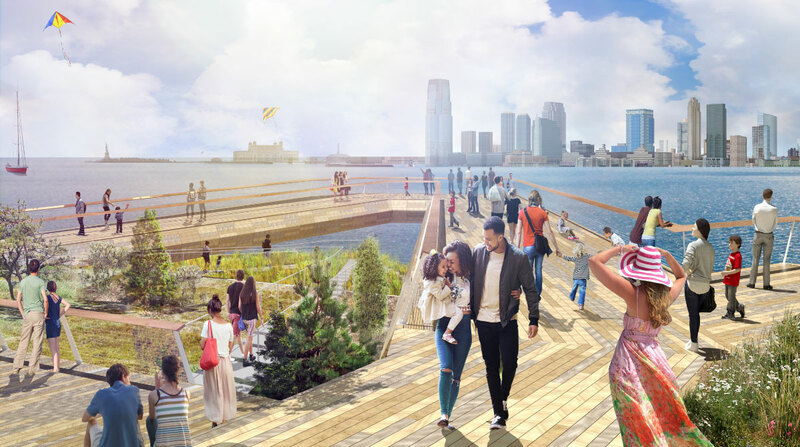 Planned for the space between Pier 26 and 25 is the Estuarium, a two-story, Rafael Viñoly Architects-designed education center. Only $10 million of the center’s required $50 million has been raised so far. 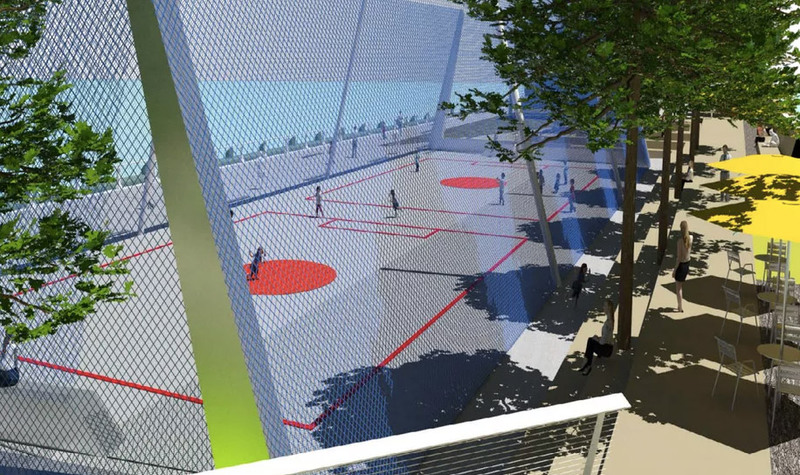 While no start date has been set for the Estuarium’s construction, it could imperil the pier’s 2020 opening date; the site chosen for the sturgeon playground will be used a staging area during the education center’s construction (sorry, giant metal fish fans). Construction on the underside of the pier will run from this summer until next year, followed by the work on the structure’s topside.